Please put Personalization here before going to Check out. Thanks! 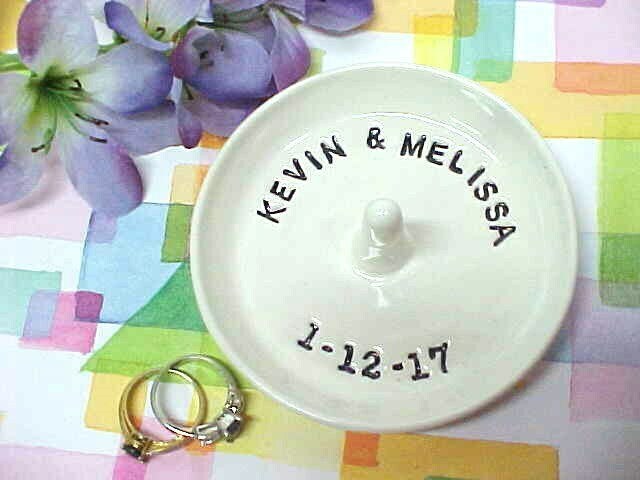 Lovely Wedding Ring Dish, Ring Bearer Alternate, or special order for your Bridesmaids. Mrs Mrs Ring Storage. Classic White glaze with Black letters for contrast. Put Names & Date or Short Personal Message in box before going to checkout! I Said Yes, for example! (If you want a Month & Date, they will all be Numerical = Numbers). Bride's name, Initials or Bride & Groom names or Date of Wedding. To add the "ENGAGED" word, please choose that in the drop-down box. Allow around 3-5 days for production, plus shipping time on top of that. Dish measures approximately 3 1/2 to 4 inches wide. Depth of dish may vary. Cork pads on bottom. The ring bowl is exactly as expected!! The seller was communicative and helpful with the order. Would definitely recommend her lovely items! !